Meanwhile, at the Aquarium... We're taking a break from our posts about the Bahamas expedition to talk about some of the animals in the Tropical Oceans Exhibits. You'll find these animals in the Giant Ocean Tank when it reopens in July. Even better, you can see these animals right now—come visit! With Giant Ocean Tank renovations scheduled to be done in the coming months, our staff and volunteers are hard at work ensuring that the tank’s 2,000 inhabitants are healthy and ready to move into their new home. Over 800 of these animals are already on campus and are currently housed inside the Penguin Exhibit, or as it’s been known for the past several months, the Tropical Ocean Exhibit! It’s a unique way to see many of these tropical animals. 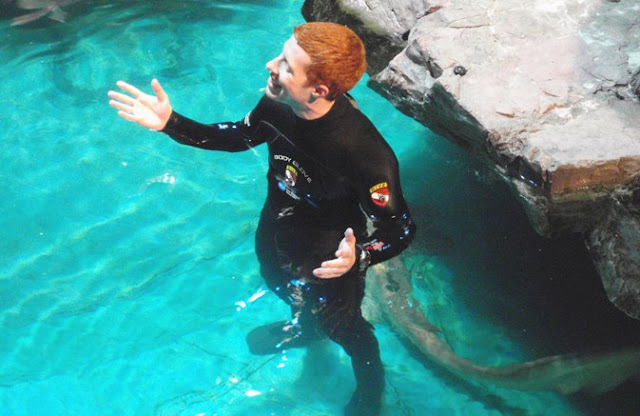 Due to the shallow nature of the Tropical Ocean Exhibit, the inhabitants swim close to the surface and are quite visible. Visitor favorites, such as the long, silver tarpon, Southern stingrays and sea turtles, are all on display. 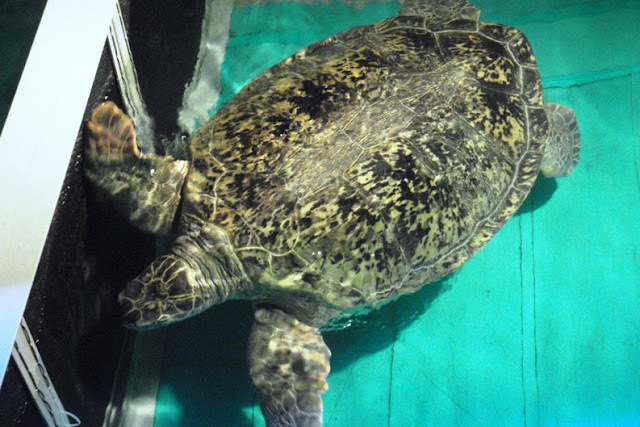 Myrtle, the Aquarium’s most famous resident, swims in her current abode. The Giant Ocean Tank’s coral reef provides a structure for the many animals that rely on nooks, crannies and rocky overhangs for cover; however, the Tropical Ocean Exhibit lacked this type of habitat. As the animals were moved into their temporary housing, the Dive crew created some habitat using, plastic PVC pipe pieces and pyramids. Watch these areas closely and you will see small inhabitants darting in and out of these innovative hiding places. Small wrasses enjoy their holding pen, complete with sand and a hiding spot. 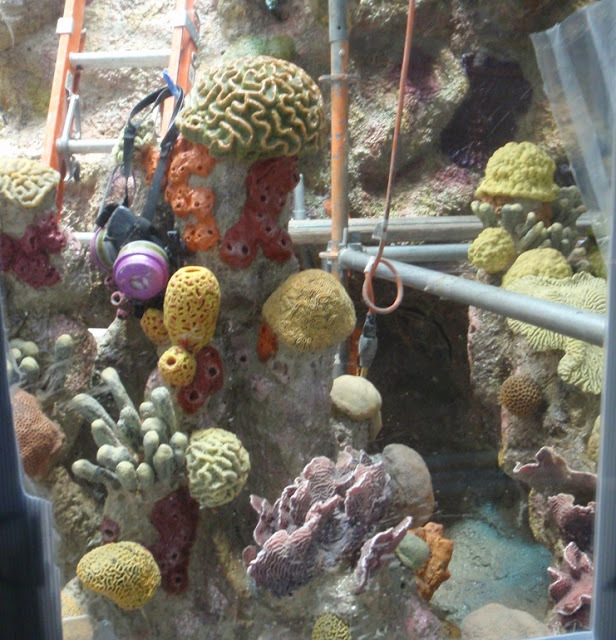 Car wash strips also work to form habitat, creating seaweed-like areas throughout the exhibit. Angelfish, butterfly fish and scrawled filefish can be seen hovering around these spots, particularly when a head of lettuce is available for a snack! 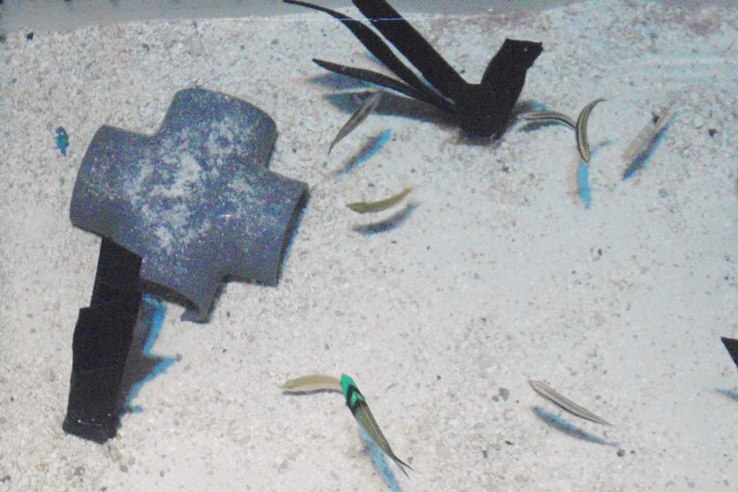 Angelfish maneuver in to grab a snack. These long strips also provide additional structure for animals inside holding pens or give shade and cover to some of our nocturnal animas, such as our green moray eel. 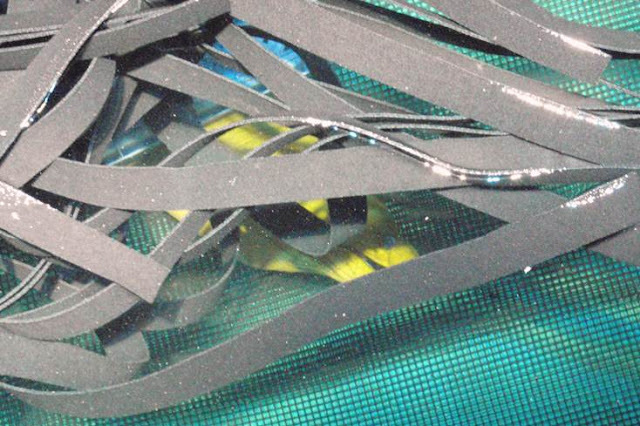 Car wash strips provide cover for our green eel. Can you find her? Looking into the Tropical Ocean Exhibit, you might see containers, barrels and floating pens scattered around. 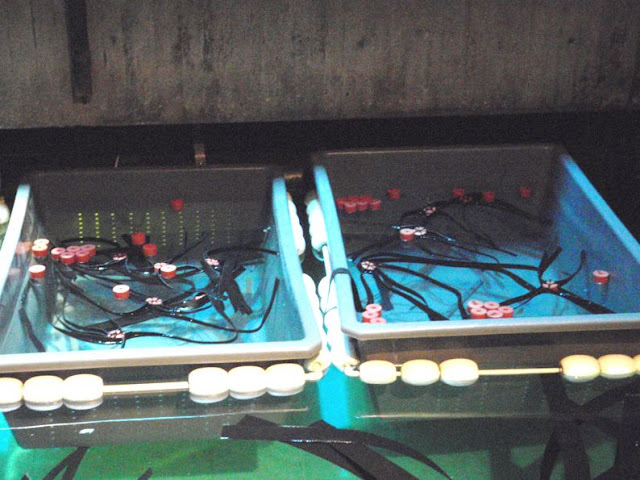 These pens allow new fish to be housed until they grow larger. It will also make it easier for the staff to locate fish once they are ready to be moved. Can you imagine trying to find a three inch fish inside the 150,000 gallon exhibit! 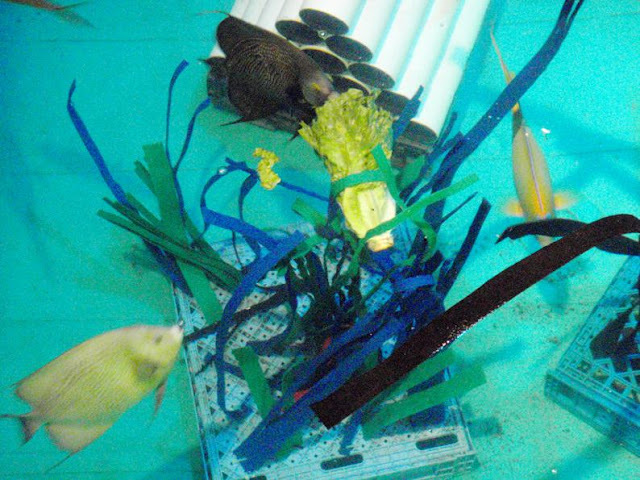 Floating holding pens housing small reef fish. The construction process is almost complete, and we will be moving animals soon! But before we do, stop by the Tropical Ocean Exhibit. Look for the Tropical Ocean Exhibit educators and ask them lots of questions, take a peak at the animals from a different perspective and view some new animals up close before they make their way into their new home! Tropical Ocean Exhibit educators are ready to answer your questions!